Yes, I have it. I knew what I had to look for, but I had some trouble finding the scorpion venom due to its small size. I know *where* to drop it, just not what it is! Nevermind, I got it! It's not Miranda's diary I have to drop, but I was thinking in the right direction: it's her portrait! How do i enter mage Faramund's workshop? i can't find the key to those giant doors. I´ve done pretty much all goals, i´ just need to enter his workshop, any help? You get there by magic! You need to find a key that opens some doors of a building near the starting area. You were probably already there: the doors were locked and looked really fancy. You need a key to get in there, and there is a magic item there. You can't get there directly. Have you been to the Court already? You need to find a mold there and produce a key from it in the Factory. yes i produced a key from that mould, but can't find its lock, where is it? Last edited by Cardia; 10th Feb 2017 at 16:08. Thanks, let's see if i can identify her house. Miranda's house is marked on the map - it's the house you went through in order to open the canal gate. ahhh right, thank you Nicked. This mission is so good I can hardly stand it. I just love a good sewer. And that has to be one of the best sewers I've seen in a long time! No my friend...the best sewer EVAR!!!!!!!!! now where is that key??!! Go to the waterfall area, look along the wall of the part that juts out with the ladder. Thanks to Nicked's help (and his gen.osm file) I've got the key and can continue on the mission! - Unknown to me before releasing the mission, there is an issue with the script TrapTimedRelay and certain versions of Thief 2. See here for more details: http://dromed.whoopdedo.org/dromed/traptimedrelayprob This appears to be affecting GoG copies of the game too. If you find certain puzzles are broken (specifically: making a key using a mould), you may need to try a different gen.osm (one of the base T2 script files). Try this one (always back up your own first): https://drive.google.com/file/d/0B_U...ew?usp=sharing. And done! 2.5hrs on Expert with 7060 out of 7882 loot! Great mission, and that beautiful sunset seemed to last forever. Mission finsihed on normal, i will replay it someday in "expert" mode. Well what can i say i simply loved this mission, if offers a huge beautiful map to explore, excellent level design , i love the ambient musics you have placed in the city, reminds me some musics of christoph of Babalon, specially this track: https://christophdebabalon.bandcamp.com/track/hunger. The gameplay is very good and very accessible , the atmosphere is pleasant it fits well with this beautiful city, the readings offer interesting stories, excellent choice of textures. Resuming this is a High quality mission. Many thanks for your beautiful work Nicked. So I finished the mission but there is one thing I am not entirely sure what it was used for: the cotton balls. A readable mentioned someone wearing them to shield his ears from the ringing of the bells, so he can sleep better. I haven't found any place where I can use the cottom balls. But I did the bell thing to get the secret, after finding the cotton, so maybe you need the cotton to ring the bells? As in, if you ring them without the cotton in your inventory, you take damage? That's the only thing I can think of. I had to use the cotton wool on one of the masks in the crypt in order for the door to open but I don't really know why, did I miss a readable? Cotton wool - can be used on the bell clappers to stop them making noise. Presumably you had already knocked all the Hammers out. If you were ghosting, then they all run up to the belltower and investigate the moment you ring a bell. The cotton wool really shouldn't have any effect on the masks in the crypt in the slightest. Could be a bug? Yep, it's a bug. I've inadvertently given them the same key ID. Just finished this, excellent work! Love the 3 dimensional aspect of the mission, complex but not too hard with a solid story! My initial impressions of this mission were mostly negative. Increased vulnerability in the dusky setting, ledges you can easily slide off, frustrating falls that make it easy to alert nearby AI, linear design with your prospective routes forward blocked off, a counter-intuitive way to proceed (there is a way that seems logical but isn't, and a way that doesn't seem logical but is). Not a good introduction. I was almost ready to put it away, but fortunately, I persevered and the mission got much better as it opened up. There is a lot of clever puzzle design in the central city area, and the mini-missions are just the right length/complexity. It also feels great traipsing around on the rooftops and finding new places to break into, or figuring out puzzle solutions using environmental cues. It is not always standard Thief gameplay, and the ledges are a bit convenient, but it is very entertaining. I loved the bank missions, the electric fence, and the little touches like the back garden and window-crashing a prostitute's room. After the middle part, the problems start cropping up again, as the mage's house and the sewers are less interesting than the urbancrawl elements, but the mission remains decent and ends on a good note. There is also the mood, a lazy, late-afternoon-in-a-Spanish-city feel, which is nicely helped by the music. 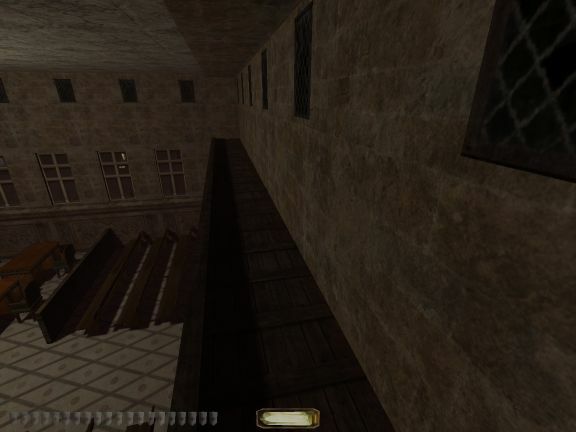 Just like the enormous spaces and dizzying heights, BCD's style reminds me of Being Thief 2, although this is a better mission, where the scale is mostly right (it could be built a little tighter, but that's just me - NewDark certainly makes this style of building possible), and the objectives are less artificial. Less, but they still feel forced, and can result in a large amount of backtracking. I understand the reasoning, just don't agree with it. All in all, this is slightly uneven, but the good parts can be really good.